There are a variety of options to choose from when it comes to getting to the Sambadrome on parade night. You can take a taxi, the subway (metro), or our no hassle roundtrip sambadrome shuttle transfer. You should avoid taking the bus to the Sambadrome during Rio Carnival. While the Rio buses are generally safe and inexpensive, on Samba parade nights traffic to the Sambadrome is a nightmare, so public buses will not be able to drop you off within comfortable walking distance of the venue. RioCarnival.net Shuttle Service — US$98 round trip! In terms of both cost, convenience and safety, your best bet is our round trip shuttle transfer. For less than the price of a taxi, our shuttle bus will pick you up from a pick up at or close to your hotel and drop you off within two blocks of the entrance to your sector of the Sambadrome. When you’re ready to leave the shuttle will take you back to your hotel, with drop off points located all along Copacabana, Ipanema, and Leblon. For your convenience, our shuttle Bus will depart the Sambadrome every 80 minutes after midnight, corresponding to the end of each Samba School procession. You really can’t beat it! Book your roundtrip Sambadrome Shuttle transfer today! The government authorizes two private taxi companies for transportation services to and from the Sambadrome. These companies have been granted permission to enter the area surrounding the Sambadrome, each providing services to a specific side of the venue. Taxis seat up to four people and should cost around US$40 for a one way trip. The Coopertramo taxi company services odd numbered sectors and can be reached at +55 21 2560-2022 OR 2560-1474. The Coopatur taxi company serves the even numbered sectors and can be reached at +55 21 3885-1000. Even if you are not using one of the government-authorized companies, the driver can still get you within reasonable walking distance from the Sambadrome. During Rio Carnival price gauging is not uncommon. Make sure you tell the driver which sector your seats are in, and establish the price before hopping in. On Samba Parade nights, virtually all roads in Rio lead to the Sambodromo. The driver knows the way but for your awareness, the best route from the South Zone is through Santa Bárbara tunnel. Coming from Rio’s North Zone the best route is through Rua Itapiru. In both cases, you must drive over São Sebastião Viaduct, which runs parallel to the Sambodromo. Right away you’ll see signs to the entrances for the various sectors. When you are ready to leave the Sambadrome, taxi cabs will be parked outside Sectors 2 and 4 and Sectors 9 and 11. For your convenience and comfort, Coopertramo and Coopatur will have help desks set up at the Sambadrome and uniformed agents outside the gate to assist you. Let the driver know where you want to go and establish a price before getting into the car. 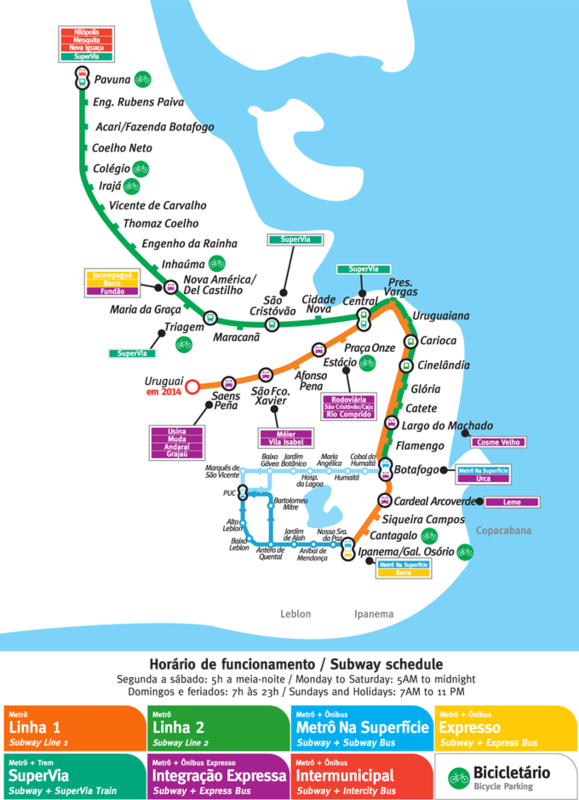 The subway is a convenient and inexpensive way to get to the Sambadrome and runs 24 hours during Rio Carnival. Trains depart every ten minutes and will be packed with both tourists and Cariocas all throughout the night. As this is a popular mode of transportation amongst parade members, you’ll see lot of colorful costumes. If you are wearing a costume to the parade, it is perfectly acceptable to wear it on the subway. On typical days the metro will take you within a ten minute walk of the Sambadrome, but with the crowds the walk can take up to twenty minutes. Remember: where you get off the subway depends on which side of the Sambadrome your tickets are located (even or odd sectors). For even-numbered sectors (2, 4, 6, 8, 10 and 12) you’ll want to get off at the “Praça Onze” subway station. When you exit the station turn right twice (right and then right again). Then walk straight until you see the Sambadrome. For odd-numbered sectors ( 3, 5, 7, 9, 11 and 13 ) you should exit at the “Central” subway station (Estação Central do Brasil). You can follow the crowd until you reach the Sambodromo. There will be signs pointing you in the right direction, but you’ll know you’re going the right way if you pass Samba Land and the floats of the Samba Schools. If you are arriving to the Sambadrome by metro from the South Zone, you should take Line 1 from one of the four subway stations in the South Zone servicing Copacabana and Ipanema. Metro Rio tickets come in two forms: Pré-Pago and Unitário. Pré-Pago is a prepaid metro card, with a minimum initial charge of R$10, and a minimum refill of R$5. These cards are available for purchase at all stations and ATM machines. Unitário metro cards are single ride fares and cost R$3.70. These cards are valid for up to two days after you purchase them. Security is very tight everywhere during Carnival in Rio. That said, the subways will be packed, so while there will be Police everywhere, it’s always advisable to exercise caution. Come prepared and keep your valuables out of sight.